Rotisserie Chicken is one of my all time favorite meats to eat. On a buffet, I will pick the rotisserie chicken first. It is hard to beat the taste of rotisserie chicken that it is cooked until it is so tender and falls off the bone. 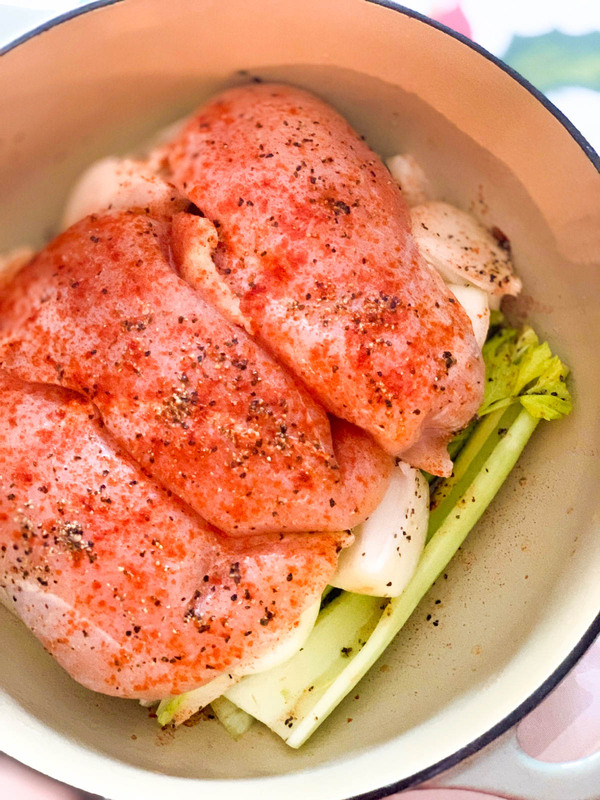 The chicken thigh is my favorite piece to eat, but on the eating plan that I am on, I can only have skinless, boneless chicken breast, so I decided to create a juicy, tender skinless, boneless chicken breast version. 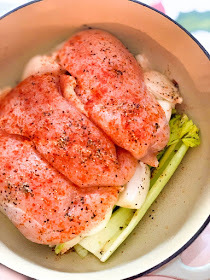 You can make a whole Rotisserie Chicken or individual Rotisserie Chicken Breasts in the oven using the same method. You will never buy another store bought rotisserie chicken again. The ingredients for the rub is straight forward, but the ingredients for the basting mixture is what elevates the juiciness the chicken breast yields. Chicken breast on their own are bland and need a lot of salt and seasoning to bring them to the height of flavor you are seeking. 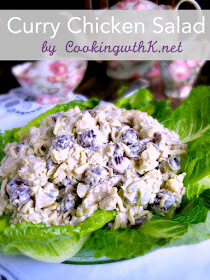 Wash and pat dry chicken breast. Place on a rimmed baking sheet. Sprinkle liberally with paprika, coriander, salt, and pepper on the top and bottom of the chicken breast. Preheat the oven 325 degrees F. Arrange celery on the bottom of a dutch oven. Arrange onion quarters on the celery. 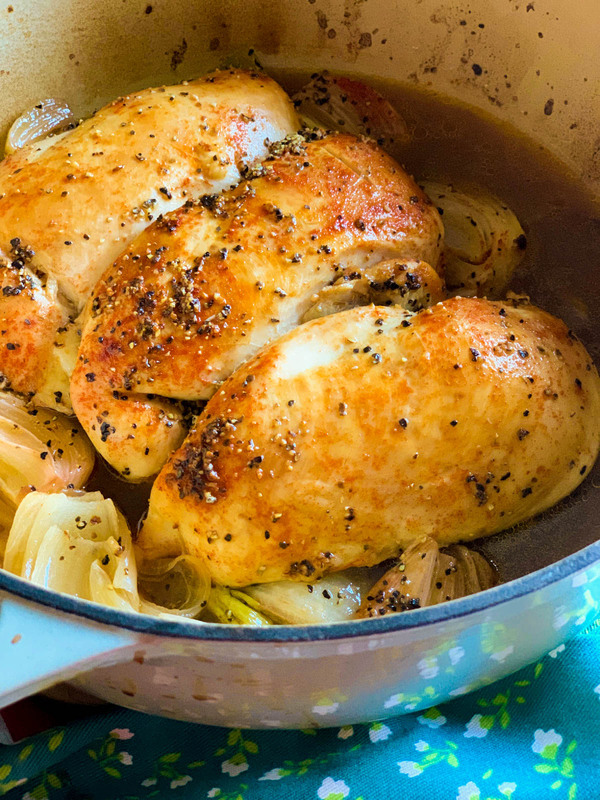 Place chicken breast close together across the top of the celery and onions. If the chicken breast doesn't stay close together, use toothpicks to keep them snug together. This is important for when they are cooking to hold the juices in the chicken breast. In a small bowl mix together lemon juice, 1 teaspoon coarse salt, and 2 teaspoons coarse black pepper. This creates a lemon pepper flavor. Brush lemon mixture liberally over the top of the chicken breast. Pour chicken broth in the bottom of the dutch oven up just under the chicken and around the vegetables. Sprinkle with another dusting of paprika. This is for color more than flavor, but we really like the taste and the kick of heat the paprika gives. Place chicken breast in the oven uncovered. Bake for 1 hour. With a baster or spoon baste the chicken breast every 15 minutes with the broth in the bottom of the dutch oven and then spoon two teaspoons of the lemon pepper mixture over the chicken breast. 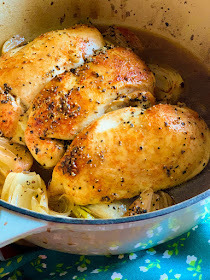 If you run out of the lemon pepper mixture just use a baster or a spoon and finish basting through the 15 minute increments with the chicken broth in the bottom of the dutch oven. After a 1 hour of baking place the lid on the dutch oven and cook for another 20-30 minutes or until the internal temperature is 167 degrees F. being sure not to overcook. I used very large skinless chicken breast and it took 30 minutes. 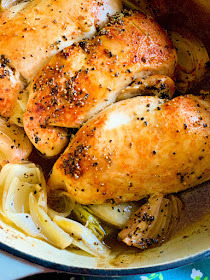 Adjust the time if you use a whole chicken or bone-in chicken breast. 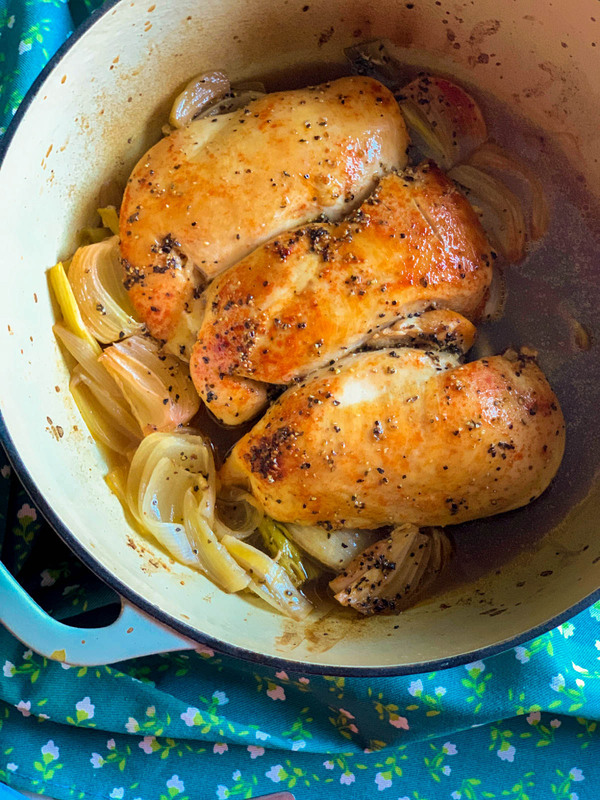 The recipe may be pretty detailed in instruction for The Best Oven Rotisserie Chicken Breast, but the bonus is they are the most flavorful, juicy, and tender Rotisserie Chicken Breast you will ever eat made in your own kitchen. 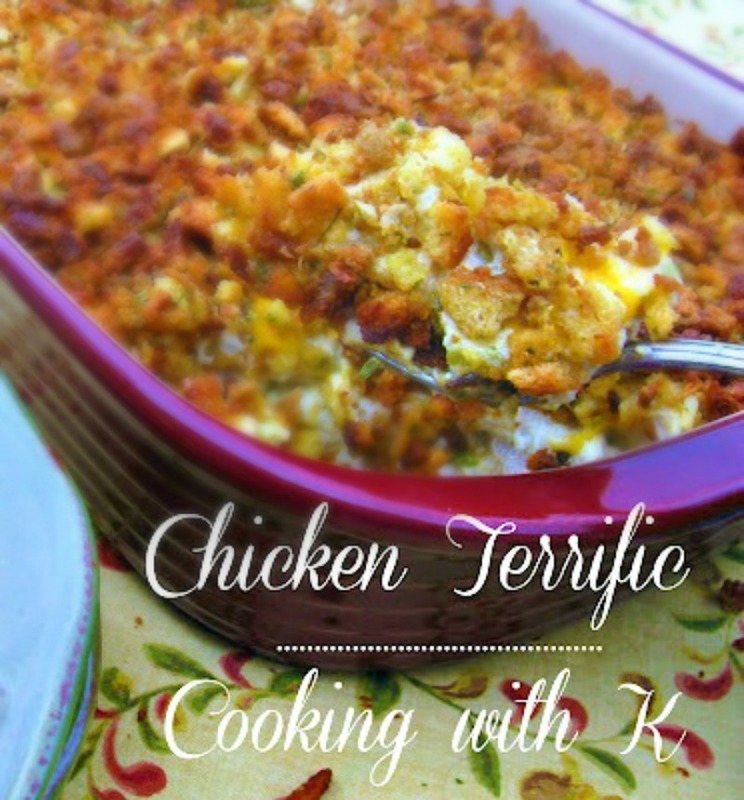 We made three full meals with this recipe. I hope you get to make this recipe soon. Brush lemon pepper mixture liberally over the top of the chicken breast. Pour chicken broth in the bottom of the dutch oven up just under the chicken and around the vegetables. After a 1 hour of baking place the lid on the dutch oven and cook for another 20-30 minutes or until the internal temperature is 167 degrees F. being sure not to overcook. I had very large chicken breast and it took 30 minutes. Hi Kay! It looks like you used skinless chicken breasts. Is that what you used? Two questions, is this bone-in or boneless chicken breasts, and are these full chicken breasts or breast halves that are more commonly sold? Thank you for the recipe.